Location: 38 15 00S 142 55 00E (external link); 7421-2-1 (Dixie) 670642 and 7421-1-2 (Terang). 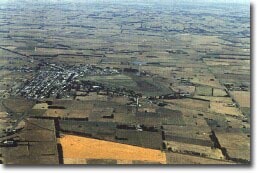 SW outskirts of the town of Terang. Princes Highway, Hampden. Private land and public land. Golf course, partly built-up area. There are also exposures in road cuttings. Lake Terang is a dry (drained) lake just over 1 km in diameter. The margins are defined by a generally low rim of tuff with a steeper inner edge, although much of this is masked by the town of Terang town buildings and facilities. A higher mound on the southern side of the maar is made of coarse ejecta including blocks of Tertiary limestone. Mount Terang on the northern side of the Princes Highway east of Terang, is apparently a later eruption and not related to the maar formation. This is a scoria cone with several thin lava flows resting on tuff, on the margin of Lake Terang. Deep coring into the lake bed has recovered cores which have been analysed to determine the vegetation and climatic history of the region. Carbon dating of these cores indicates that the eruption occurred a minimum of 40 000 years ago. State: The site, which includes road cuttings and other small exposures on the edge of the town area, preserves an excellent, long and varied record of volcanic processes. Lake Terang and Mount Terang appear to belong to independent and separate volcanic events. Although the geomorphology of the site is quite disturbed, there is sufficient cohesion of significant features to warrant developing a conservation plan, to preserve a record of the volcanic history of Lake Terang and Mount Terang. Ollier, C.D. 1967a. Landforms of the Newer Volcanic Province of Victoria. In J.N. Jennings & J.A. Mabbutt (eds). Landform studies from Australia and New Guinea. ANU Press. pp. 315-339. Ollier , C.D.1967b. Maars: their characteristics, varieties and definition. Bulletin volcanologique 31, pp. 45-73. Joyce, E.B. & Knight, M.J. 1973. A buried soil with fossil gilgai within the volcanic deposits at Terang, western Victoria. Victorian Naturalist 90, pp. 272-278. Kershaw, A.P., Baird J.G. D'Costa, D.M., Edney, P.A., Peterson, J.A. & Strickland, K.M. 1991. A comparison of long Quaternary pollen records from the Atherton and Western Plains volcanic provinces, Australia. In M.A.J. Williams, P. DeDeckker & A.P. Kershaw (eds). The Cainozoic in Australia: a re-appraisal of the evidence. Geological Society of Australia Special Publication 18, pp. 288-301.